Clouds are made from Paint brushes, took me around 2-3 hours to create a cloud that i wanted. great job! love the cloud you make ^^! Dead Fantasy ROCKS, and so does this wallpaper, you should make something with the Tifa picture Montyoum used to have up! Yeah that Monty Oum guy is incredible in making his videos. Thanks for the wallpaper upload. Its also awesome! Awesome! That's a very nice wallpaper ^^ Glad you could make it! It's beautiful what you did with it. 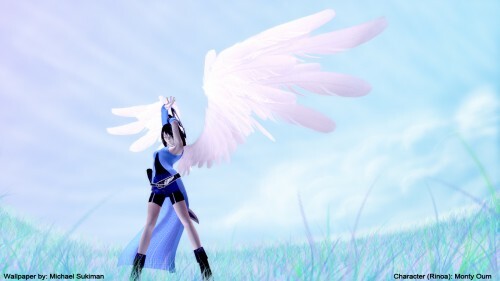 :D Most other people wouldn't/couldn't change her shadings from a dark one to a brighter one, and it's very nice to see Dead Fantasy Rinoa in a new light. Well done. Thank you for giving me an angel on my PC.